Our mind can create pain through different causes as well as intensify or decrease the pain level. We will discuss the answer to this question by breaking down the different causes. The topic of this article today is with regards to chronic pain and how the body processes pain through a pain sensory system. What is the Pain Sensory System? To explain this further, it is important to understand that pain represents a very minimal percentage of our sensory system. This is the system associated with our nervous system that registers sensation (e.g. touch, warmth, etc.). As a result, this pain sensory system does not accurately represent the severity of an injury and we can very easily overload the sensory system. Another term is the pain sensory system overload. While I do not want to get into the details of the nervous system and the different sensory systems associated with this process, I do want to present a general idea that hopefully is easier to understand. I always give the image in the office that if one bit their tongue or had something heavy fall on their toe, they would probably not notice the chronic pain in their neck or shoulder. While this may be only temporary, it can also cause a desentization or masking of low level chronic pain. This is important to understand as a new injury (e.g. shoulder injury, knee injury, etc.) can lead us to forget about our chronic back pain. This can potentially result in further aggravation of our chronic injury. Another example of pain sensory overload is stress. Most of us are under some level of stress associated with life. Stress is extremely harmful to our bodies. It can affect our metabolism levels, our immune system, our bone formation, and much more. It is important to understand that high levels of stress create increased production of the steroid hormone cortisol. As a result, cortisol can also mask chronic pain. It almost acts as a drug to allow us to continue to perform or operate at a high stress level. With high levels of stress we can function or power through chronic pain. However, at some point the pain level will eventually rise higher than the level of cortisol and result in a flare-up. This is the common reason we don’t understand how the injury occurred. I regularly hear “I wasn’t doing anything before my back went out” or “I only bent down to pick up a pencil” and much more. We will discuss this further as stress deserves its own chapter with regards to chronic pain. Other examples of pain sensory overload include activity level, desensitization, over stimulation, and more. 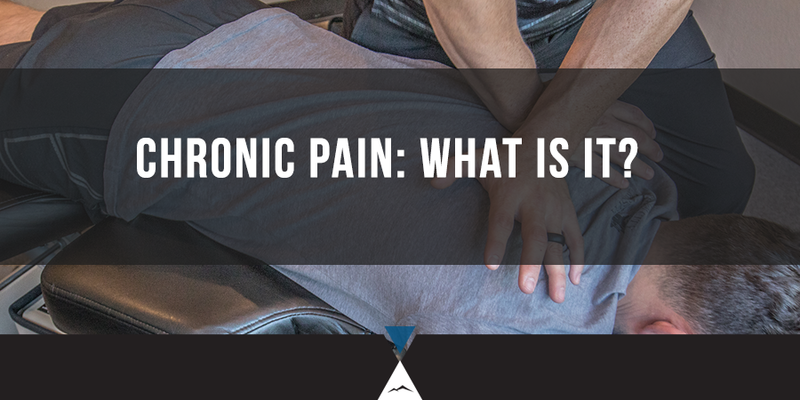 Without going into too much detail, the main point to understand is that pain is primarily a sensation. While high levels of pain can restrict our ability to move, think, and perform; it does not affect our body’s ability to function. Many people would strongly disagree with this statement but when I ask most of my patients who are suffering from chronic pain: “If I could take away your pain would you still be able to function?” The overwhelming answer is ‘yes’. Following up on our pain sensory system, it is also important to understand that the duration of pain does not accurately equate to the severity of an injury. Pain sensation is usually the last thing we feel with regards to an injury and the first thing that goes away when healing from an injury. What this means is that an injury can be occurring at a low level or being masked by high levels of stress. When this occurs, the injury process has begun and leads to further tearing, stress of tissues, blood flow restriction, and more. These small injuries or micro-injuries lead to larger injuries (macro). Once the pain starts to become noticeable, the injury may already be weeks if not months in the process. In addition, as an injury heals, the pain sensation is usually the first thing to be eliminated. This does not mean that the injury is fully healed. I try to explain that an injury takes time to heal. A typical cut on our skin takes at least a week or more to fully heal. And during this healing process, we can easily re-injury the wound by improper treatment (e.g. scabbing, scarring, etc.). As a result, we need to respect the healing process regardless of the level or intensity of pain. In conclusion, while pain is an extremely important part of how we diagnose and treat an injury, it is also a small component of the injury and very rarely determines the severity of an injury. The presence of pain does not always determine when an injury has occurred and the absence of pain does not always determine if an injury has healed or is healthy enough to return to normal activities. Understanding how our body works and communicates with our nervous system will help in our ability to thrive. Examples include hunger, temperature (hot or cold), exhaustion, dehydration, and much more. We will next talk about the different types of pain and how they relate to an injury.